Don’t let your gutter problems cause you any more headaches! To achieve comprehensive exterior property protection, for homes and commercial properties, every building system needs to be operating perfectly. Of the range of exterior components designed to keep your property safe from damage, particularly from the rain, the guttering system is one of the most important. A well-designed guttering system, constructed from high-quality materials, will act as one of your property’s first lines of defense against water damage; keeping the interior and exterior of your home or workplace safe from the serious harm that rainwater can cause. If your guttering system isn’t doing its job properly, or you want a new guttering system that’s more capable of protecting your property in the long term, then it’s essential to act quickly. At Apex Exteriors, we specialize in exterior property care, maintenance and upgrades. Our services range from siding installation to roof maintenance and replacement, and includes a full service for guttering repair, replacement and installation. If you’re concerned about the quality of your guttering, the design of the system, or existing damage to the gutter materials, then we’re always on hand to help you find the best and most affordable solution in the Chicagoland area. Gutter systems may seem like a small component in the great scheme of exterior property protection, but without a capable guttering system, your property could be exposed to some serious moisture-related issues. If you don’t have reliable gutters, the structural integrity of your property is put at risk, and both the exterior and interior of the building could be damaged. The primary role of a guttering system is to carry rainwater away from your home or commercial building – removing the threat of rainwater from the immediate area around your property. A well-designed guttering system will be positioned to collect the water runoff from the roof of the property. Once the rainwater is safely in the guttering system, it’ll be directed towards the downspouts, which will carry the water to the drainage system to be properly disposed of. This simple process can mean all the difference between a property that’s dry and safe from water damage, and a property that’s subjected to the full threat of excess water. The team at Apex Exteriors are highly knowledgeable in all areas of guttering system design and installation, so if you’ve noticed problems with your guttering system that’s preventing it from carrying out its primary role in your property’s protection, please don’t hesitate to contact us today. -The gutters or downspouts becoming clogged with leaves or other debris that prevent water being drained properly. -Downspouts not being properly aligned to allow for adequate drainage away from the immediate property area. -Ice causing the guttering to become backed up and preventing drainage. -Sagging of the gutters that cause the guttering to slowly begin pulling away from the structure of the property. -Poor pitching of gutters that prevents the water draining adequately into the downspouts. -Holes appearing in the guttering that cause leaks. -Leaks in the joints causing damp in the interior of a property. -Inadequate design of the guttering which can lead to poor drainage or standing water in some areas. No matter the problem that you’re facing with your guttering system in Chicago, IL, Apex Exteriors can help you to find a fast solution that will secure your home or commercial building now and for many years to come. -A clog in the system may cause the rainwater to overflow and saturate the foundations of your building. This can cause serious problems with the structural integrity of your property. -Leaks in the guttering system can lead to isolated damp, where the excess water penetrates the exterior walls of your property and causes damp patches to appear on the interior. This could eventually lead to mold appearing on the surface of the walls. -Poor downspout design, which doesn’t direct rainwater to the drainage system, can cause exterior surfaces, like driveways and paths, to be seriously damaged. -Without gutters, or gutters in good condition, siding can easily become damaged or stained. Depending on the type of siding installed, it may also begin to rot. -Soil erosion may be the result of water gathering around the immediate area of a property, instead of being carried away. The erosion of soil on your property can lead to further foundation problems. -Blocked downspouts can lead to overflowing, which can cause major flooding in properties with basements. Guttering does more than just dispose of rainwater, it protects the very structure of your property, and lowers the risk of mold, damp, and rot around your home. If you’ve noticed any of these problems occurring, then it’s vital that you contact the professional gutter repair and replacement team at Apex Exteriors. We will assess the damage, and either repair any damage to your existing guttering system or design a replacement system that will be able to handle rainwater on your property. Don’t have an existing guttering system, and worried that the lack of system may be causing problems around your home or commercial property? Not to worry! We can also take care of brand-new gutter installation, giving you a peace of mind over how well your property is designed to fight back against water problems. To combat the vast differences between guttering problems and the consequences of gutter issues, and to provide solutions for every home, we offer a comprehensive range of guttering services. At Apex Exteriors, we always strive to find the solution that’s best for your unique property, in terms of function and aesthetics – your guttering system doesn’t have to detract from the exterior look of your home, it can actually enhance it! We offer a range of solutions to repair faulty or damaged guttering, upgrade existing guttering systems with innovative products, and install entirely new systems that have been designed to work with the layout of your property – Apex Exteriors is the one stop shop for all your guttering needs. Whether your gutters have started to corrode, or leaves and other debris have caused holes to appear in your guttering system, the experts at Apex Exteriors can take care of the problem. We’ll inspect your guttering and suggest a solution to fix any holes and enable your guttering to once more function as it was designed to. We also have additional options for leaf protection systems, that are designed to keep your gutters free from obstruction and help them to last longer. A leaking gutter is a sign that all is not right with your guttering system. The team at Apex Exteriors will make sure that any leaks in the joints of the guttering system, or leaks due to holes, are properly fixed to prevent any ongoing problems that the water leak may cause. With in excess of 30 years of experience working with an extensive range of rain-ware systems, you can count on our team to find the best ongoing solutions for your guttering. A simple problem with the pitch of your gutters, that prevents water draining into the downspout, can cause a long list of serious problems, but with a little help from our Chicagoland team, they can be completely avoided. We can handle guttering pitch problems big and small, so that you always know that your gutters are draining water away safely and effectively. If your property has a very old guttering system that’s beyond repair, or is lacking any guttering system, then Apex Exteriors are the best service in the Chicagoland area to call. Our extensive knowledge of roofing and exterior property maintenance and improvement make us the perfect service to install a brand-new guttering system that will be an asset to your home or workplace. We offer a beautiful selection of gutter types to create an aesthetic that’s practical but also elegant and perfectly matched to the exterior of your property. A professional finish to enhance the look of your home and an exceptional performance that’s designed to last is a guarantee when you choose Apex Exteriors to install your new gutters. Our vast experience in rain-ware systems means that we can resolve any issue, big or small. If your downspout has started to leak or has become fully disconnected, then one call to our team will make sure that the problem is resolved before any major damage occurs. We can reconnect all types of downspout and take care of any problems with the downspout at the same time, so you can rest assured knowing that the same problem won’t happen again any time soon. Your rainwater drainage system is critical, you need to be sure they are installed the right way the first time. 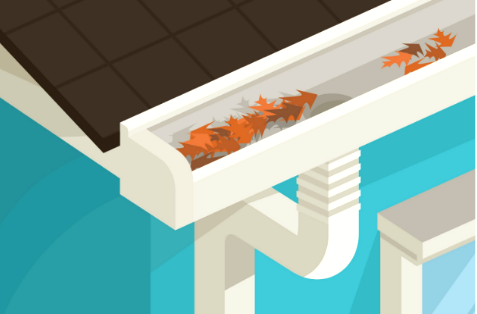 The truth is, installing rain gutters is not as simple as it seems. You can tell a poor installation from a professional one just by looking. There has to be a lot of designing and thought behind a good installation. For example, where does the water need to run off? Is a certain area in the home a good place to have a downspout in? Working with Apex means hiring professionals with years of experience, detailed knowledge of all types of gutter systems, and the know-how to resolve any issue. With our harsh winter weather, eave details and ice protection are critical components to properly functioning gutters. We take all necessary steps covering every detail to insure proper drainage away from foundations, landscaping, and walkways. Beautiful gutters enhance the appearance of your home, making it look well cared for and classy. Our highly skilled installation technicians can deliver and install a gutter system that is both practical and aesthetically pleasing. At apex we offer all types of seamless residential and commercial gutter systems in many sizes and material types. We use only the highest quality products available today. Ask your estimator which system is right for you. Installing a new downspout is a process that requires more than just attaching the downspout; a lot of consideration needs to go into how the downspout will impact property drainage. At Apex Exteriors, we’ll make sure that the installation is nothing less than perfect to protect your property and its foundations, as well as making sure that your guttering is protected against extreme weather. By working with the uniqueness of your property, we’re able to tailor the installation to account for all the architectural detailing on your building. If your guttering has started to become loose or has sagged and separated from your property, then we have the solution. Our new guttering systems are designed to solve the problem and give your home or commercial building a complete facelift – restoring the function and aesthetics of your property. By stocking gutter systems in a number of sizes and in a great range of different material types, we have the solution on hand to stop loose gutters leading to serious moisture problems. If you’re worried about your water consumption and want a more environmentally friendly management system for the water drainage on your property, then you can talk to one of our knowledgeable team about our rain barrel installation service. Installed directly on existing or new guttering systems, a rain barrel will give you a source of free water, saving you money on water use and reducing your overall water consumption! Installing guttering is not always straightforward, just a small mistake can cause no end of problems. That’s why it’s always best to call in a professional to take care of the installation or repairs and upgrade your system to one that can protect your home. No matter your exact guttering requirements, or the problem that has occurred, you can count on Apex Exteriors to provide the best solution with an unrivaled service. We also offer a variety of leaf protection systems. With the combined experience of our staff, our quality is unmatched. Over the years we have recruited some of the industry’s top installers with more than 30 years experience with various types of rain-ware systems. At Apex Exteriors we provide our customers with earth friendly gutter system options and solutions. At Apex, we’re committed to the environment and now offer rain barrels to help consumer water consumption. We can install them directly to your current gutter system. Ask about the many designs options available that will work well with your home! Gutter problems can be the result of wear and tear over the years or the result of sudden damage, but there’s always a solution to restoring or replacing your guttering that doesn’t have to cost the earth. Despite our use of high-quality materials and guarantee of an exceptional service backed by installers with decades of experience, at Apex Exteriors, we always make sure that our prices for guttering repair and installation are affordable. Guttering issues shouldn’t go unresolved, and your property shouldn’t have to wait any longer than what’s strictly necessarily before having a high-quality gutter system installed. If you would like to learn more about our services in Chicago for gutter repair or replacement, our solutions for gutter installation, or our eco-friendly options for reducing water consumption, then please don’t delay in contacting the team at Apex Exteriors today. Gutter systems are one of the most important exterior components of any home or commercial building–they do more than just move rainwater away. Clean gutters are essential to the long-term health of your home or business. Let Apex Exteriors make an impact on how your house performs in our ever-changing climate! Do not hesitate to call us for a free estimate.